In this series, our writers living in Singapore take a look at the local startup companies coming under the spotlight in Southeast Asia. We bring you the insider’s insight into Southeast Asia’s IT industry today. We have been focusing on the startup companies featured in Startup in Asia held in May by Tech in Asia, which introduces Asia’s startup scene. What are these ‘Selfies’ Trending Globally? Taking your own self-portrait may be considered too embarrassing for us to fully accept in Japan. However, this has become so popular overseas that the term ‘selfie’ has been used to describe the trend. It has even been chosen as Oxford Dictionaries Word of the Year 2013, and has appeared in English conversation over 170 more times compared to last year according to the Oxford University Press. 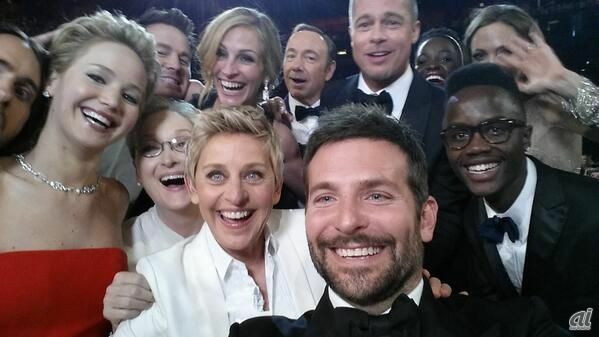 One of the factors which led to the rise in popularity of the selfie was this photo, taken by the American Academy Awards host Ellen Degeneres with her smartphone. It features an all-star cast with American celebrities such as Brad Pitt, Meryl Streep from “Devil Wears Prada”, Kevin Spacey from “American Beauty”, etc. With a record-breaking 3,200,000 retweets and 1,700,000 favourites on Twitter, the trend spread throughout the world. Selfies are all the rage in Asia, too. Not limited to Singapore, you can spot young women and couples taking out their smartphones to take a photo of themselves on the train, in cafes, and all sorts of places. Although they don’t seem to be bothered by the public gaze, neither do the public seem particularly bothered. Feeling embarrassed by selfies and occasionally giving such selfie-takers a cold gaze may be a Japanese trait. 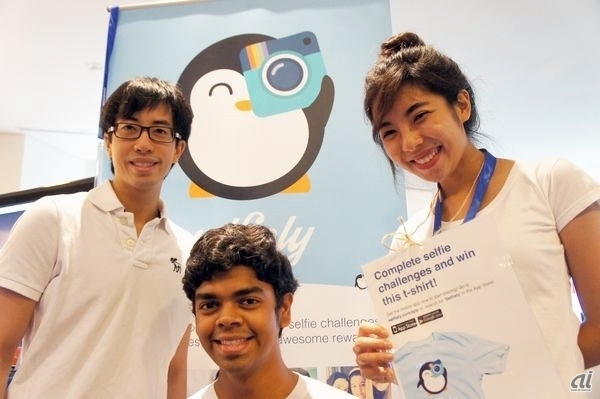 Selfiely is an app aiming to stir up the ‘selfie culture’ in Asia even further. This was developed and soft launched by Gametize, a Singaporean firm providing platforms to support gamification in mobile apps, as the company’s showcase product during Startup in Asia. Since then, there has been a positive response by users, which Gametize has in turn responded to by devoting their full effort in further development of this app. Selfiely is as much a photo-sharing app, where users compete for votes for their selfie photos, as it is a game app. Users login using their Facebook account and choose the ‘quests’ they wish to accept. 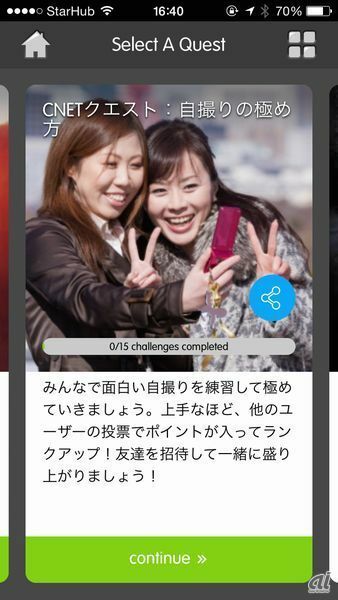 Within each quest are challenges which prompt users to post their own photos and compete according to the points they earn from votes and comments. For example, in the CNET Quest prepared by Gametize for this article, the aim is to master interesting selfie techniques through challenges such as “Take a selfie using a mirror”, “Take a selfie with your best friends or family”, “Take a selfie with the coolest IT product you own”, etc. You can apply various frames, stickers, text and effects to your selfie photos and post them with a caption. Each photo posted earns users 10 points from the start. Furthermore, every 1 vote by other users earns you 1 additional point. Currently, although users with the most points are not given any special incentives, users still actively post their own photos as it allows them to interact with their friends in a fun way. In future, incentives such as rewards from sponsors and photo-printing for the most popular users may be established. The app is currently free to download and use. In time to come, in-app purchases to unlock features such as accessing celebrity selfie challenges may be introduced. Moreover, there are plans for monetization in the form of paid sponsors being invited to create quests for publicity of their brand and services or products. There are other competitors existing in the market overseas, the most popular being Shots, which is invested by popular musician Justin Bieber, in addition to others such as Selfie Challenge and Selfie Battle. In order to gain ground against these predecessors, Selfiely is actively improving its service based on user feedback, and is devoted to maintaining an active community where photos running counter to public morals are kept to a minimum, especially where the tendency is towards the contrary for such photo-sharing apps. Gametize aims to acquire 500,000 to 1,000,000 users in the next 12 months. Pingback: MVP of the Week: A rose among the thorns… the Multi-lingual Ninja!Gametize Blog | where our zenful ninjas play and share. | Gametize Blog | where our zenful ninjas play and share. Pingback: MVP of the Week: Here we have… The Java Ninja | Gametize Blog | where our zenful ninjas play and share.